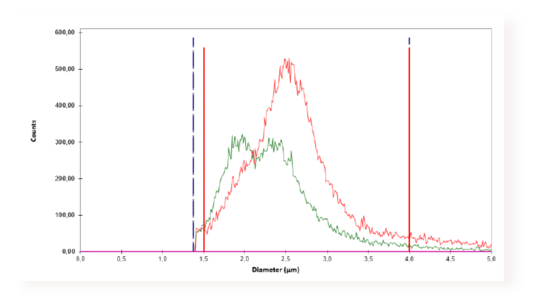 A short application report shows you how CASY, is used efficiently and reliably to measure platelets, cell volume and cell aggregation in a simple workflow. In the original paper*, standard platelet rich plasma (PRP) was studied for the interaction with implants. In addition to the count of platelets, CASY was employed to investigate the platelet volume and the aggregation behavior. Here is the Application report. And here the original publication. The example data shown in the report were measured with CASYworX .. Like to try the software? , Drop us an Email at : casyworx@OLS-bio.de or use the comment box below. Platelet-Activity, measured with CASY TTC. Red: Patient with normal, active platelets. Green: Patient with mostly inactive platelets (small volume) after being transfused with active platelets (bigger volume). *: Brown S, Walter M, Schulze F, Lendlein A, Young F. Changes in platelet morphology and function during 24 hours of storage. Clin Hemorheol Microcirc. 2014;58(1):159-70. two: 10.3233/CH-141876.